Researchers image and count nucleosomes in the human genome for the first time ever. In 1953 Watson and Crick first published the discovery of the double helix structure of the DNA. They were able to visualize the DNA structure by means of X-Ray diffraction. Techniques, such as electron microscopy, allowed scientists to identify nucleosomes, the first and most basic level of chromosome organisation. Human DNA is packaged by regular repeating units of those nucleosomes throughout the genome giving rise to chromatin. However, due to the lack of suitable techniques and instruments, the chromatin organisation inside a cell nucleus could not be observed in a non-invasive way with the sufficient resolution. Now, for the first time, a group of scientists at the Centre for Genomic Regulation (CRG) and The Institute of Photonic Sciences (ICFO), have been able to visualise and even count the smallest units which, packaged together, form the human genome. The opensource study is published in Cell. The current study was possible thanks to the use of super-resolution microscopy, a new cutting-edge optical technique that received the Nobel Prize in Chemistry in 2014. In combination with innovative quantitative approaches and numerical simulations, the team were also able to define the genome architecture at the nano-scale. Most importantly, they found that the nucleosomes are assembled in irregular groups across the chromatin and nucleosome-free-DNA regions separate these groups. By using the STORM technique, a new super-resolution microscopy method, the researchers have been able to view and even count nucleosomes across the chromatin fibers and determine their organisation. The team state that STORM overcomes the diffraction limit that normally restricts the spatial resolution of conventional microscopes and enabled them to precisely define the chromatin fibre structure. This enabling technique allowed the researchers to go deeper and, by comparing stem cells to differentiated cells (specialised cells that have already acquired their role), they observed key differences in the chromatin fibre architectures of both cells. The lab found that stem cells have a different chromatin structure than somatic (specialised) cells. At the same time, this difference correlates with the level of pluripotency. The more pluripotent a cell is, the less dense is its packaging. It gives the medical community new clues to understand the stem cells functioning and their genomic structure, which will be helpful for example, in studying cell reprogramming. What the current study has found is that DNA is not regularly packaged with nucleosomes, instead nucleosomes are assembled in groups of varying sizes, called ‘nucleosome clutches’, because of their similarity to egg clutches. The team found that pluripotent stem cells have, on average, clutches with less density of nucleosomes. In addition, clutch size is related to the pluripotency potential of stem cells, meaning that the more pluripotent a cell is, the less nucleosomes are included in its clutches. Even though all the cells in the human body have the same genetic information, they are not expressing all the genes at the same time. So, when a cell specialises, some of the DNA regions are silenced or less accessible to the molecule that reads the genome, the RNA polymerase. Depending on the specialisation of the cells, different levels of DNA packaging will occur. This new work establishes a new understanding of how the chromatin fibre is assembled and packaged forming a specific DNA structure in every cell. This research definitively contributes to the understanding of a novel feature of stem cells and their DNA structure, which is important for maintaining an induced pluripotent state. A joint patent has been filed by ICFO and CRG, who are now exploring business opportunities for marketing the classification of ‘stemness’ state of cells, ie, their degree of pluripotency. The team summise that this technique could determine with single cell sensitivity the pluripotency potential of stem cells, thus having the capacity of becoming a standard method of quality control of stem or pluripotent cells before their use in cell therapy or research in biomedicine. 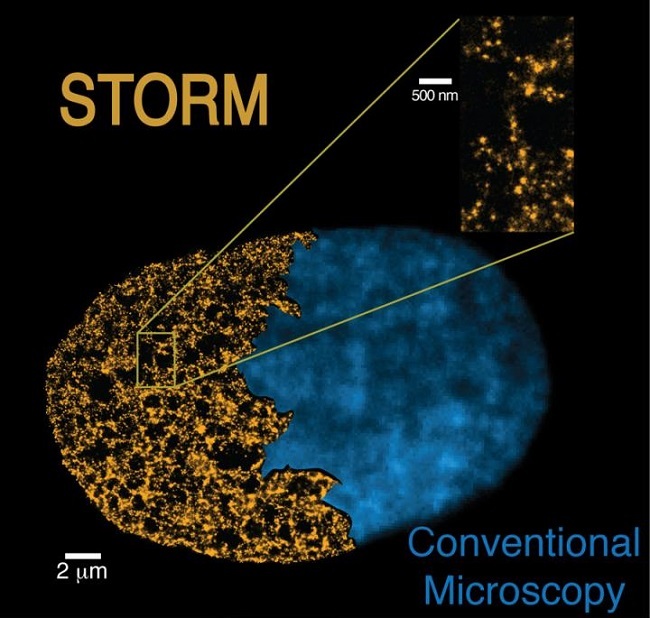 This is a comparison between an image of the nucleus of a cell obtained with the STORM technique (left yellow image) and one obtained with conventional microscopes (right blue image). The STORM technique shows its power to resolve the genome structure at the nano-scale. Credit: CRG/ICFO.